CHANCELLOR George Osborne prepared us well for this horrendous budget, delivered last Tuesday. We knew well in advance it was going to be swingeing. And the media did its share, repeating the Tory mantras “tough but fair” and “we’re all in it together” over and over again as though saying it enough times would make it so. “THE GLOBAL financial crisis started in the unregulated finance and banking sector. 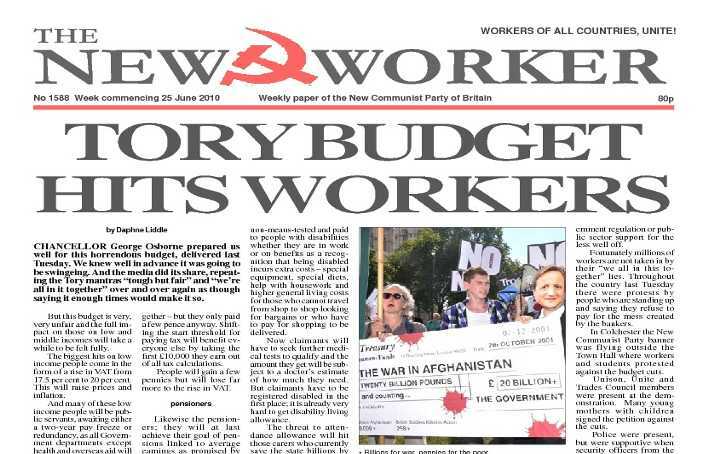 But now the ruling class is trying to shift the responsibility on to the working class and in particular the public sector,” Matt Wrack, general secretary of the Fire Brigades Union, told the Morning Star conference last Saturday — and his words summed up the theme of the conference.